the Gunn Oscillator and the modulation signal were studied. the problem is the IV converter. it should be a high-pass. the reflected microwave signal is negative voltage. there are 2 things to determine the microwave frequency. – the modulation signal and the knob is Gunn Oscillator. The Above diagram is the Setup. The upper one is laser unit, the 2 devices between Sample Chamber and CRO is field Sweep Unit. and the lower part is the Microwave unit. and of course the NMR unit and the Power and Cooling unit for the Static B-field. The Laser we use is a Class 4 Ar ion Laser ( Coherent TSM25 ), wavelength is 454.5 nm to 528.7 nm. Maximum power is 25W. the laser beam was reflected by a mirror to fit the space of the lab. and it pass through a lens with 100mm focal length so that the beam gets converged on the position of the beam chopper. after the chopper, the beam diverged and it passes another 100mm focal length lens to be come parallel. before it goes to the sample, a 1:99 beam splitter splits the beam such that 1% of it go to a power meter. the signal of the power meter is used to control the microwave and field sweep. this part is the optical pumping for polarizing the electron. although the chopper is moving at high frequency, when the chopper cut the laser, the power meter signal will be decreased. and this event will trigger the microwave and field sweep to transfer polarization to protons. the triggering is by the Controller. The field sweep unit is all-in-one. the field will be monitored by the CRO and controlled by the Controller. This part contains most devices and trouble me. since i just follow the menu and not fully understand the function of each devices. i try to explain. this is the starting point. the voltage of the power supply can be adjusted by a knob. the Modulation signal can be adjusted by a “Bias ADJ” and “Output Cont”. The “Bias ADJ” change the level. and “Output Cont” change the slope. the frequency of the Modulation Signal is 23ms. and the signal will chop out negative value. the signal also monitored by a cable from the back to the CRO. the monitored signal is a fixed signal with fixed “Bias ADJ” and “Output Cont”. the maximum power output is 150W to the Gunn Oscillator. Gunn Oscillator is used for general microwave according to the modulation signal. when the voltage of the modulation signal is low, the frequency of the microwave is low. This is for reduce the microwave power. the reason for using this, is that the RF amplifier has maximum power input 100W for pulse and 20W for CW signal. or to say, the working range is that. This is for amplifier the MW signal. and the RF amplifer can be controlled by a remote device, so that the amplify ratio can be change to on or off. 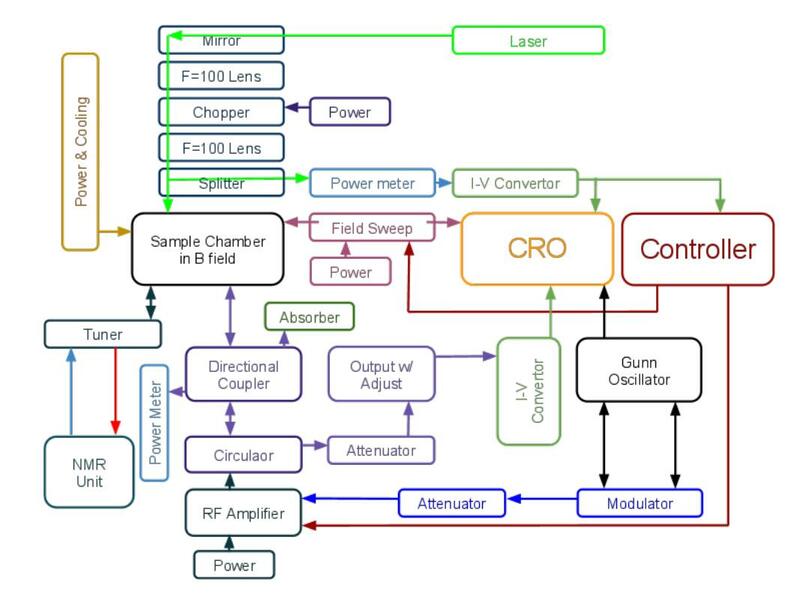 this is important, since after the laser polarized the electron, the chopper will cut the laser, then microwave and field sweep come in to transfer the polarization to the proton. therefore a remote controllable device is needed. i don’t know the amplify ratio and maximum output. the RF signal will go to the circulator. there are 3 ports on the circulator. the function for the circulator is circulate the signal. the signal from port 1 will only go to port 2, port 2 will only go to port 3, and port 3 will only go the port 1.
we have to detect the reflected microwave to find out the resonance frequency of the microwave cavity in side the sample chamber. and we don’t want to mixed up the signals. there are 4 ports in Directional Coupler, 1, 2, 3, 4. most of the signal from port 1 will go to part 2 and little bit of it will got to port 3. but most of the signal of form port 2 will go to port 4 and only less to the port 1.
i don’t understand this part. the microwave then enter the cavity and get reflected when the input frequency is not the natural frequency of the cavity. the reflection signal will go to the port 2 of the directional coupler and then the port 2 of the circulator. the signal will be diverted to port 3 and enter an other attenuator, for decrease the power. This should be corrected to “Crystal Converter”. it convert the microwave into current signal. the maximum input is 20W. therefore, it need an attenuator before the microwave come in. it simple convert a current signal into a voltage signal, so that we can wee in CRO. an easy part is the NMR system. since we have 1 single machine for generate NMR pulse and analyzing the NMR signal. the only thing we have to do is adjust the tuner. the tuner is a variable capacitor, so that it can matching the impedance of the NMR frequency and the NMR coil ( which inside the chamber) to give Maximum power delivery. this is for the static B-field. when we run the microwave system, the absorption of the reflected wave is too small and not symmetric. we tried every possible setting and check the cables. not thing wrong. may be the microwave coil inside the chamber has problem. that is what we are going to do.